Within the boundaries of South Africa lies the Cape Floral Kingdom, the smallest of the world’s recognized floral kingdoms. Its five distinct biomes contain nearly one-third of South Africa’s 22,000 seed plant species, according to the South Africa National Biodiversity Institute's website PlantzAfrica. Much of the world recognizes these dramatically beautiful species by their common, garden plant names. Twinspur diascia (Diascia rigescens) grows wild on South Africa's moist, grassy mountainsides and in sunny areas along woodland edges. It has heavily branched, sprawling stems with thick, toothed, heart-shaped green leaves. Twinspur's open clusters of pale to deep pink, rose-throated blooms are heaviest in summer and are appealing in hanging baskets or cascading over stone walls. Hardy to USDA plant hardiness zone 8 (minimum temperature of 10 degrees Fahrenheit), this diascia likes full sun and fertile, moist, well-drained soil. Slender red hot poker (Kniphofia gracilis) is a lily family perennial of South Africa's grasslands. Standing 3 feet high, it has thick, food-storing roots--rhizomes--and an erect stalk rising from a clump of grayish green leaves. The flamelike midsummer flower spike--covered in yellow, deep-orange or bicolored tubular blooms--accounts for the common name. These deciduous, bee-attracting plants perform best in climates where winter temperatures remain above freezing, notes the PlantzAfrica site. Growing best in sunny, well-drained locations, slender red hot poker is a showy addition to shrub and perennial borders. Salt-tolerant baby sun rose (Aptenia cordifolia) is a succulent, perennial groundcover up to 6 inches high. Its thick, flat green leaves have water-retaining bladders that gleam in the sunlight. From spring to fall--August to April in South Africa--baby sun rose has short stalks of small, shiny, red or purple flowers. Thriving in the sandy garden soil of the Eastern Cape coast, baby sun rose is a good erosion-control plant. It demands full sun to partial shade. Regular pruning controls legginess, according to the PlantzAfrica website. A parent of the Gerbera daisy hybrids common in gardens around the globe, Gerbera daisy (Gerbera jamesonii) grows as a perennial in the South African grasslands. Its hollow, arching stems rise above a clump of dark green, downy lobed leaves. 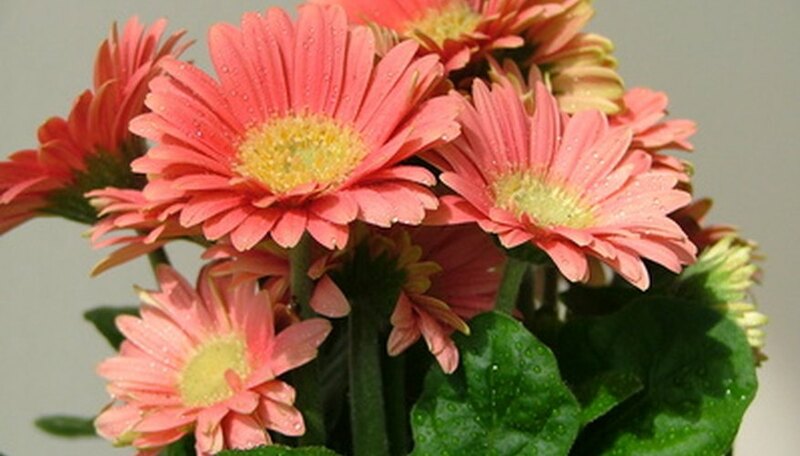 Blooming most heavily in the cool days of spring and fall, native Gerbera daisy flowers have flat, creamy centers surrounded by narrow petals (rays) in shades of orange, red, pink or cream. This plant needs a sunny, well-drained location and moderately moist soil. Regular summer feeding and removal of spent flowers encourages continuous flowering, states PlantzAfrica.com.